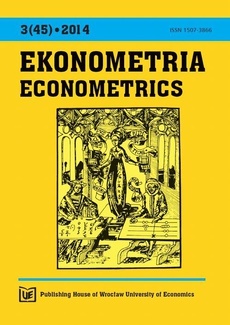 In the forty-fifth issue of the journal Econometrics eleven articles are published. First, three authors discuss social problems of Polish people by means of multidimensional statistical methods. Consumer behavior in different dimensions is described in next two articles. The article by Janusz Korol and Przemysław Szczuciński concerns the competitiveness of industry in Polish regions. The use of econometrical, statistical and mathematical methods in the analysis of finance is shown in next three papers. Michał Jakubiak in his article shows the influence of order picking zone’s configuration on the time of order picking process. The authors of the last article present the use of logistic regression in the ovarian cancer diagnostic.